Научно-практический медицинский журнал выходит с 1999 года. Предназначен для специалистов всех уровней в области организации медицинской помощи, клинической фармакологии, практического здравоохранения. Публикует научно-методические и нормативные материалы по проблемам стандартизации, управлению качеством, доказательствам эффективности методов диагностики и лечения, фармакоэкономики, аккредитации, лицензирования и сертификации в здравоохранении. Журнал рецензируется. взгляд (в рубрике публикуются материалы, носящие дискуссионный характер). Согласно Правилам для авторов, все статьи, поступающие в редакцию журнала «Проблемы стандартизации в здравоохранении», проходят рецензирование. Рукопись научной статьи, поступившая в редакцию журнала, рассматривается заведующей редакцией на предмет соответствия профилю журнала, принятым требованиям к оформлению материала статьи (соответствие объема статьи, наличие аннотации, ключевых слов на русском и английском языках, наличие списка литературы и ссылок на него в тексте и др.). Рукописи, не отвечающие принятым требованиям к публикациям, не регистрируются и не допускаются к дальнейшему рассмотрению, о чем уведомляются авторы. Заведующая редакцией направляет статью на рецензирование одному или, при необходимости, двум рецензентам из числа членов редакционной коллегии, редакционного совета (по согласованию с главным редактором журнала) или ведущих специалистов по профилю данной работы, которые имеют в течение последних 3 лет публикации по тематике рецензируемой статьи. Сроки рецензирования определяются заведующей редакцией с учетом планируемых сроков издания журнала. Решение о целесообразности публикации после рецензирования принимается главным редактором (зам. главного редактора), а при необходимости – редколлегией в целом. Заведующая редакцией доводит до сведения автора о принятом решение по статье. В случае отказа в публикации статьи она направляет автору мотивированный отказ. Копии рецензий (или мотивированный отказ) на рукописи предоставляются редакцией авторам, а также экспертным советам ВАК, в Министерство образования и науки РФ по их запросам. Рукописи, принятые к опубликованию, хранятся (вместе с рецензиями) в редакционном архиве в течение пяти календарных лет. Рукописи авторам не возвращаются. 115446, Москва, Коломенский проезд 4, а/я 2, ООО "МТП Ньюдиамед"
Индекс журнала 79284 по каталогу агентства ОАО "Роспечать" "Газеты и журналы"
Scientific-practical medical journal published since 1999. Designed for professionals at all levels in the organization of care, clinical pharmacology, practical public health. Publishes scientific-methodological and regulatory materials on the problems of standardization, quality management, evidence of the effectiveness of methods of diagnosis and treatment, pharmacoeconomics, accreditation, licensing and certification of health care. The magazine is reviewed. sight (in the category are published materials bearing controversial nature). 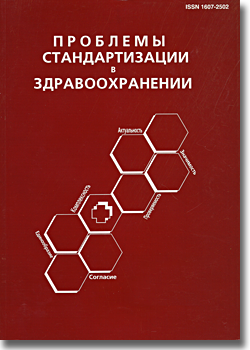 The procedure for review of manuscripts received by the editorial board of the journal "Problems of standardization in health care"
According to the Rules for the authors of all articles submitted to the journal "Problems of standardization in health care" are reviewed. The manuscript of scientific articles, received by the editorial board, is considered by the head of the editorial staff for compliance with the profile of the magazine, the requirements for the design of material article (volume of articles, the presence of annotations, keywords in Russian and English languages, the availability of bibliography and references to it in text, etc.). Manuscripts that do not meet the requirements of accepted publications, are not registered and are not allow for further consideration, of what the authors are informed. Head of the editorial staff sends the article for review to one or, if necessary, two referees from among the members of the Editorial Board, the Editorial Board (in consultation with the chief editor of the magazine) or the leading experts on the profile of the article. In the review it should be reflected: matching the material presented in the article, the profile of the magazine, assessment of the relevance of the content of the article, whether the level of the material contained corresponds to the modern achievements of medicine and healthcare, significance of the research results (scientific, practical), a qualitative and / or quantitative assessment of given in the article actual and illustrative material, evaluation of the completeness and accuracy of the presented data, the accuracy of used (or entered) definitions and wordings, assessment of the literary style of the article, as well as conclusions about the article as a whole, notes, specific recommendations for its improvement. The review should be completed with the clear conclusions (recommended for publication, modification, publication considered as impractical). The terms of the review are determined by the head of the editorial staff, taking into account the planned timing of the publication of the magazine. The review is carried out on a voluntary basis. If in the review of the article there is an indication on the need to improve, it is sent to the author for revision. In this case the date of receipt of the editorial board is considered to be the date of return of the modified article. If an article because of the recommendation of the reviewer has undergone substantial processing of the author, it is sent for re-review the same reviewer. The editorial staff reserves the right to reject article when there is an inability or unwillingness to take into account the wishes of the edition by the author. The decision on the appropriateness of publishing the review is accepted after the editor in chief (or deputy editor in chief), and if necessary - the editorial board as a whole. Head of the editorial staff informs the author of a decision on the article. In case of refusal to publish an article, a reasoned refusal will be send to the author. Small fixes of stylistic, nomenclature or formal nature, not affecting the content of the article, are included in the article without the consent of the author. Reviews of manuscripts are presented to manuscripts’ authors and expert advisors in the VAC Committee at their request. The Ministry of Education and Science of the Russian Federation at their request. The reviewers and editorial staff have no right to use the information about the contents of the work before it is published in their own interests. The manuscripts are the private property of the authors and they are not a subject to disclosure. Manuscripts accepted for publication are stored (with the review) in the editorial archive for five calendar years. Manuscripts are not returned. Director of Publishing House Bulanova V.А. Journal index 79284 at the agency catalogue Rospechat "Newspapers and journals"